Sadly, mobile clones of successful franchises are a strangely common thing these days. Despite the obvious copyright infringements, developers seem to have no shame in creating almost identical (but almost always weaker) versions of popular titles - one such Splatoon clone actually made its way to stores just over a year ago. Oddly, presumably attempting to cash in on Splatoon 2's recent success on Switch, that very project (entitled Sepia GO! - so there's a Pokémon GO! reference, too) seems to have made a comeback. Just like before, everything from the gameplay, animations, music, and menus are all way too familiar. Amazingly, the developer is reportedly searching for a worldwide publisher, clearly aiming to release the game on mobile stores in other countries. With Nintendo being so well known for taking swift action against projects much more innocent than this one, it's hard to believe that the developer truly believes it can get away with releasing the game outside of China. Would anyone like to hazard a guess on how long it'll be before we see the project taken down? Feel free to leave your thoughts in the comments below. Oh it's fine, Nintendo don't seem to care about rip offs making money off their ips/ideas. Dem thigg legs on those rip-off inklings, though, boi! Seriously, though, the only thing more hideous than those off-brand Inklings is the music. I'm still more amazed by the fact that people apparently get enjoyment out of games like these. I tried playing with a virtual stick and button once ... I most definitely did not enjoy the experience. This game will work in China but it is too alike to Spaltoon to be released in other stress. In Fact Nintendo might have trouble bringing Splatoon to China as this game could consider Splatoon 2 the rip off. I hope they don’t think they’re original, great developers or anything. It looks better than Splatoon. @QwertyQwerty Weird isn't it? It's one of the most regulated countries in the world, just look at the restricted internet over there, yet they don't seem to care about copyright infringement at all. Its more sad than anything poor mustards couldnt even have a original idea it Miyamoto sat on there head and crapped giant piles of golden deku turds! In the words of everyone's favourite U.S president , China ! There are hundreds of rip off Nintendo games on the app stores here in the UK. Or at least there was right up until Mario Run. They are good at taking down PC related stuff but not so much on phones. I think Apple tell them where to go if there's not a direct copyright infringement, just similar gameplay ideas and art style. Also China is infamous for not caring about stuff like this so if it stays within China they won't have a chance of taking it down - other countries are a bit more fair though so I agree it's unlikely to release elsewhere. 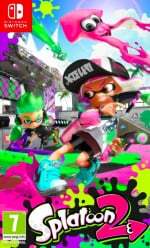 I always thought that Splatoon kinda ripped off Jet Set Radio. I feel Ashamed as half Chinese-Indonesian people to see Chinese people with shameless keep doing Copycat, Counterfeits, any Illegal activities. LEGO did a challenge mini-game like Splatoon in the newest LEGO Marvel game. Obviously not the same, just found it interesting and well suited for a LEGO game. Well, it's technically not illegal to rip-off a game's mechanics, recent court cases have solidified this*, and despite looking sooo much like Splatoon, all that artwork and music is original artwork and music as far as I can tell. It's treading a very, very fine line though, I'd say. The beginning of the music sort of reminded of a worse version of another piece from a soundtrack. Perhaps Pokémon. Another part is a straight up copy of the Splatoon soundtrack just distorted. @impurekind I was about to say the same thing. You can't copyright ideas, only actual works/text/art/code. You would need to patent specific original game mechanics to protect a game. @impurekind Did you hear the sound of the bomb and when these... things get splatted? It's directly ripped from Splatoon. @Octane The reason that they do not care about copyright is because copyright law for all intensive purposes is non-existent in China. This stems from the fact that all law and China is setup to keep the People's Party in control with as little opposition and influence from the west as possible. It therefore plays to there advantage to have no copyright law and not respect copyright law from foreign countries at all. It helps the government there create a business atmosphere where Chinese companies have an advantage and it allows the government to make it seem to a less informed people that all these great ideas for games or products originated in China. Sorry for the run on. Political Science and East Asian Studies Double Major, so this is a big area of interest for me. @impurekind The sound effects sound ripped right out of Splatoon though. @GracefulGazelle Sounds like a good plan, but it's horrible. Copyright laws exists for a reason. Like saying killing a man is not forbidden, you just have to pay a really small fee, so people can then come in your country and kill whoever they want, giving money to the country. Good plan for the economy, horrible plan humanly. Wow, just wow. It doesn't even try to be different. I bet it plays horridly too. @brandonbwii Who knows. I'm just speculating here. @Mopati Again, I'm just speculating regarding the sound. My assumption is that they weren't being so bold as to literally steal assets directly. I'd be more concerned about websites publishing articles that encourage console hacks and direct downloads to ROMs. Remember when they used a Breath of the Wild footage on an ad to a COMPLETELY different game? @QwertyQwerty This should actually accelerate Nintendo pushing Switch in China. Because while some developers are shameless, most players are not. Most of us want to play original content. But since Nintendo has not had any huge success to publish any console in China, it makes it difficult for players to (1) learn new IPs from Nintendo, (2) call developers out since they don't know any better other than what the greedy developers show them, and (3) actually support the big N.
If Nintendo wants to put a stop to this, just filing lawsuits is not enough. I knew several Chinese kids through exchange programs. Many of them bought switch online through third party sellers to play the actual Splatoon, because they know it exists. The other thing is, if Sony and MS can publish their consoles and games in China, I don't understand how and why Nintendo is having difficulties. Once they can publish their content there, it would be a lot easier for the government to shut down copycats, too. @GracefulGazelle Law is one thing. People's awareness is another thing tho. I've seen screenshots of Chinese criticizing copyright infringements on their social media, and how others stand with them. Many people, especially original content creators and artists, are not okay with developers spoiling their environment. It's easy to raise awareness in a small country. Not so much with a 1.4 billion crowd. Info takes a lot longer to spread. The reason behind developers being shameless is that they can still generate profits even when they just copy others' ideas. I've heard (still need to be confirmed) that they haven't updated/raised their punishments for copyright infringements for a long time, so the cost of illegal activities like this is minimum to developers. When people are aware and stop supporting, developers will be forced to create new things on their own, and the law will eventually work better. This looks terrible, the ink isn't even behaving properly. What’s annoying is they never link the game, I don’t care if it’s a knock off its mobile ported and free! Given this has happended before & still no one links the iOS one can find the android one easy ..
Stupid so what it’s a knock off ! I’m sure there are many that would like to try’s thank you very much.. I played many knock offs some are very good & show that Nintendo could put DECENT games into the AppStore & not the free junk we get now I welcome these knock offs & I hope they keep coming to the point where there easy found! Yeesh. There's no way people can find that game interesting. Yup. Only thing worse than China is North Korea. @Mopati Also, on the music...there's clearly bits of Splatoon music in there. Or at least the main riff from Splattack in there, making the song sound like a weird off-key remix of Splattack (also the numbers filed off version of 'Now or Never' and the music from the results screen when you lose at the end there lol). @SarahMarieFiren You don't want to play this, trust me. It's pretty terrible. It plays as bad as it looks like it plays. In the time since I last heard anything about this game they don't seem to have really improved anything...just taken out some of the more blatant copying. Way before this, it was Dark Souls rip off. Then the Overwatch rip off. What's more and next? I know China has some craziest technologies, been there actually. But at the same time, they are also famous for faking things, from plastic rice to fake meat and everything else. They are so indeed lack of ethical. Not saying all of them. Although China is one of the biggest population, but even at 1% to 5% of China's population, imagine how many of them are faking these things? Few millions perhaps. @Octane it’s a remarkably unregulated place. Red tape to start a business is nilch. Environment and safety regulations are improving but scarce. Briberies are all too common for police to turn a blind eye. Knock off products are all too common and the courts protect local over transnational branding (look at Best Buy or New Balance there) it over regulates religion and politics. Not so much business. It’s in that light this knockoff makes sense. @RGnsd I agree entirely however China is still a non-democratic system where popular influence is often weak at best. I think copyright law is much more likely to change from economic pressure from major corporations than from the people anyways. Sad but true, and too close to way to many democracies.